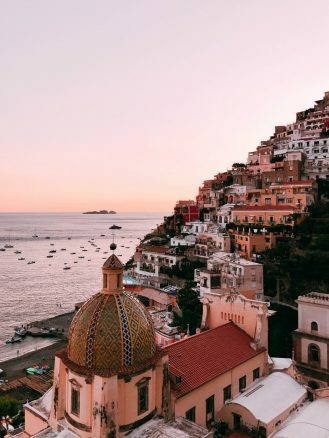 With cliffsides of colorful buildings and Mediterranean blues only interrupted by the occasional isle, Italy’s Amalfi Coast is one of the world’s most picturesque places. 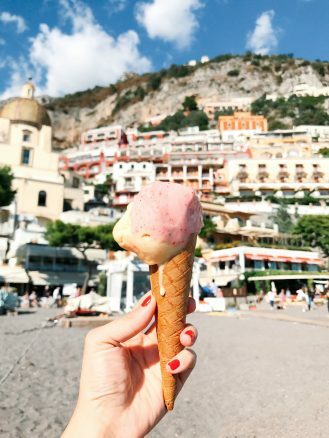 Stopping over in Praiano, Positano, Sorrento and Ischia, photographer Ana Linares dishes on the details of her road trip, and there’s plenty of limoncello on the menu—pasta, gelato and jaw-dropping views too. To arrive at Casa Angelina involves a picturesque drive, with cliffs in view, from Napoli to Praiano. 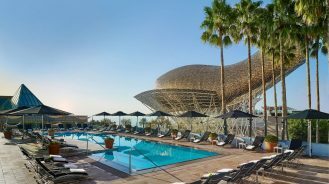 Akin to a breath of fresh air, the hotel beckons with its bright, white spaces and vantage point overlooking the Mediterranean. Step out onto a room’s balcony and there’s Positano in the distance. Framed with lemon trees and lined with suntan beds, their pool deck is a little slice of heaven. The hotel’s location allows guests to discover the charming town of Praiano by foot, as well as do day trips to Amalfi and Ravello by scheduling a private boat which departs from the beach. Their breakfasts and dinners are simply delicious, and made all the more delightful by the views that punctuate every moment here. From Praiano, it’s a 25-minute drive to Positano. Roll into town later in the day, and admire how the afternoon light reflects on the colorful houses. 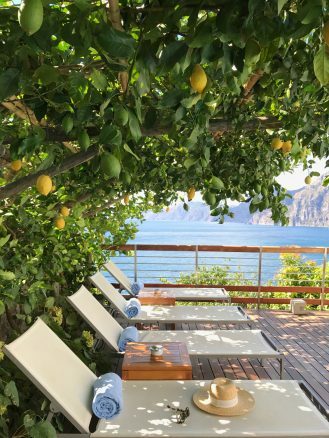 Chilled limoncello on their terrace is the warm welcome Villa Franca provides. After check-in, continue that mood at the rooftop pool with delicious burrata, a glass of wine with endless views. Walk into town for a day of wandering or hop aboard the hotel’s shuttle service—it runs every hour. 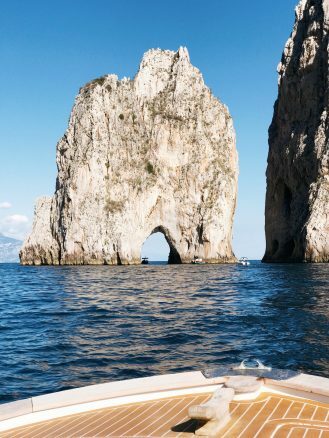 Through the hotel, request private boat service to Capri for a tour of the Blue Grottos—it’s magical and so worth it. Next stop: Sorrento. There are two equally lovely ways to get here—by car or ferry. In the heart of the city, the Grand Hotel Excelsior Vittoria is a family-owned property dating back to 1834. The Victorian-era building and grand gardens feel like a movie set. The rooms that look out onto the sea and Mount Vesuvius beyond are especially breathtaking. 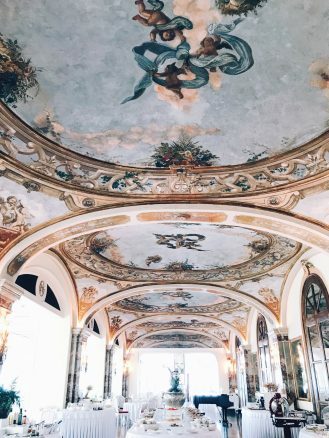 There are more Bay of Naples views at breakfast, and the fresco-filled dining room itself is a thing of beauty. Nested within the garden, their outdoor pool is nothing to scoff at either—enjoy it daily before heading to the markets and shops down the street. Say arrivederci to Sorrento and ferry to Ischia Island. It has that The Talented Mr. Ripley vibe because, true story, the movie was filmed on the island. 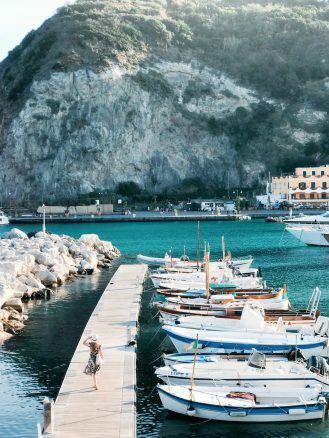 Tourists flock to Capri, but this is where Italians go for a nearby getaway. Private and secluded with the deep blue Mediterranean out front, Mezzatorre Resort & Spa is like something out of a dream. Spend a day relaxing by the oceanside pool, opting to take a dip there or in open ocean. 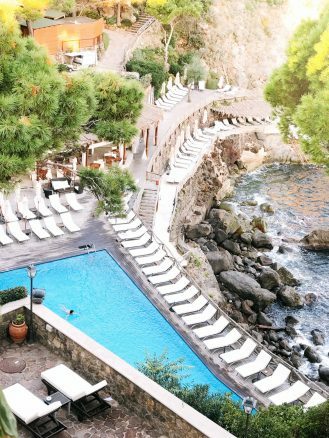 Recharging here will give you a second wind to explore Ischia and the small town of Sant’Angelo. The Fire Beach Club at At Casa Angelina is the place for sunset drinks—or day drinks and a swim. Located right on the water, this beautiful bar has a deck with suntan beds and astounding views. 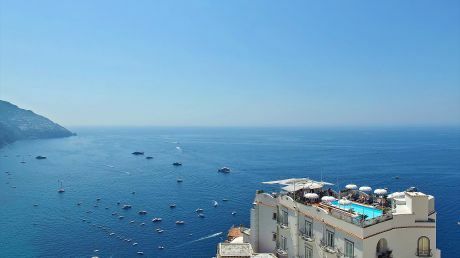 You can also catch a boat directly from the beach to Capri, Positano or Amalfi. Steps from Casa Angelina, Bar del Sole makes a lovely snack and gelato stop while exploring Praiano. Ordering an Aperol Spritz is never a bad idea—especially here. 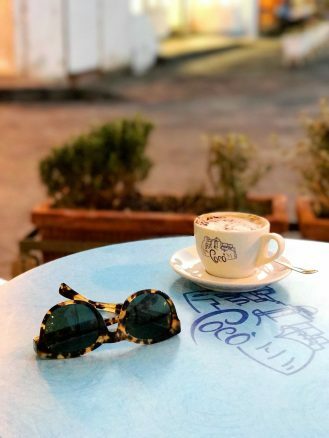 To partake in the delights of La Fontenila in Capri, be sure to make a reservation. For those who do a day on the isle, the restaurant will arrange a private boat pick-up from the main marina to its scenic location beneath the Faraglioni rocks. Order the Clam Linguine and, of course, an Aperol Spritz. 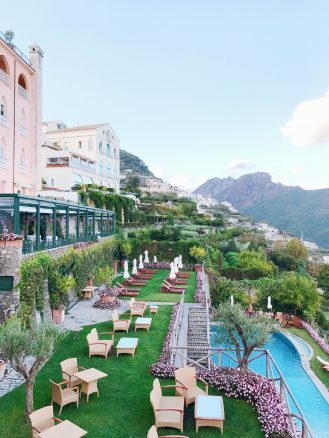 Rossellinis is located in Ravello’s beautiful Palazzo Avino, a stunning 12th-century, pink-hued property perched on a hill surrounded by a lush garden and Amalfi Coastline views. Order yummy Italian smoothies in the morning and cocktails during sunset from its Terrazza Belvedere. At Le Sirenuse, La Sponda is another one of those places where you’ll want to book in for dinner months in advance. The meals are most memorable, and the sunsets equally so. 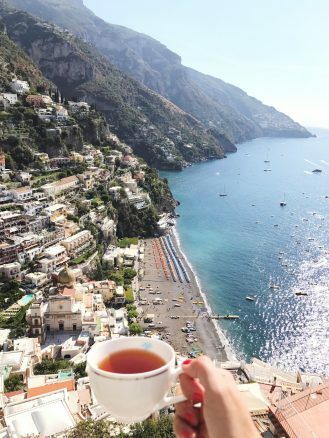 Be sure to bring your camera when you come—the property’s pool and Positano views are worth capturing. By the beach overlooking Positano’s marina, Bucca di Bacco dishes out incredible stuffed zucchini flowers, burrata, salmon tartare and risotto. Pair any or all of those with their amazing house Pinot Grigio. From the tiled terrace floors under foot to the art pieces adorning the space, this family-owned restaurant delights in every way. Another Positano gem, Max is named for its owner, who has stories to tell and an incredible art collection to show off. The restaurant feels like an artful home—stellar wine selection included. The squid stuffed mozzarella is delicious, and they offer cooking class for those keen to learn more about their menu. Within the Grand Hotel Excelsior Vittoria in Sorrento, seaside restaurant Terraza Bosquet has an incredible view to Mount Vesuvius and the marina. Fresh seafood pasta and wine plus sunset is the perfect recipe for a wonderful night. Drive or, better yet, walk to Minervetta, a hotel filled with furniture pieces by some of the best Italian designers. 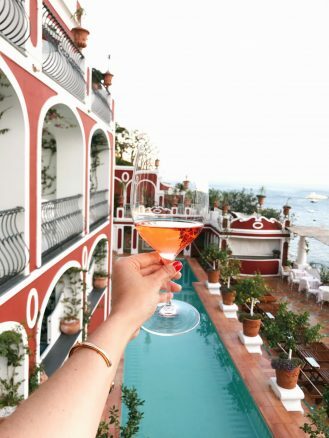 Their terrace has the most beautiful view to Sorrento, making it a perfect spot for a drink. In Ischia, at Mezzatorre Resort and Spa, this Michelin-starred restaurant boasts both a delectable pasta selection and those all-important dinner views. After day of swimming and sun bathing, it’s a treat to enjoy a lovely meal mere steps from one’s hotel room. After visiting medieval Castello Aragonese in Ischia, swing by Bar Coco. 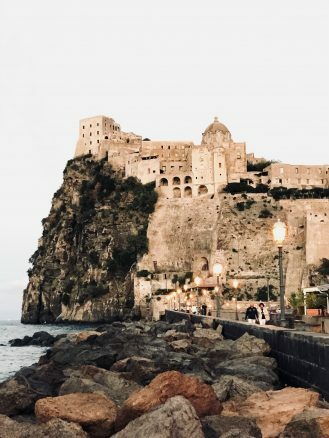 Known for having the best espresso on the island, they’re conveniently located right by the Aragonese bridge as you enter the castle. Positano brims with cute little shops to stumble upon. Don’t miss La Bottega Di Brunella. 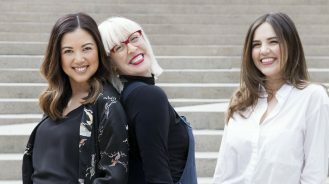 The circa-1965 store is still family-owned and sells the loveliest linen dresses and jumpers. 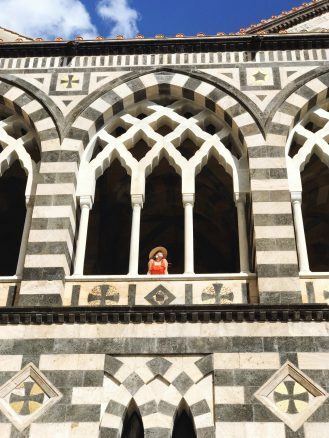 With it being so easy to travel the coast by ferry or a boat, make sure to spend a day in the town of Amalfi. Here, have lunch by the 9th-century Catholic Cathedral—the architecture is amazing. 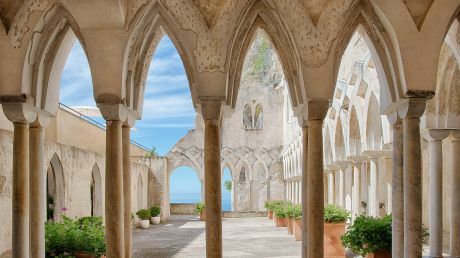 A 20-minute ride in a local tour bus from Amalfi, Ravello is one of the most scenic locations outside Positano. You’ll also find yummy gelato. 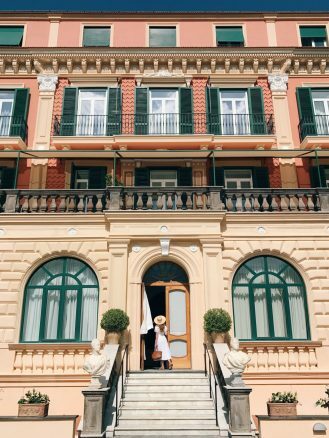 Head to Palazzo Avino for the those big views and Belmond Hotel Caruso for an aperitivo. Rent a scooter and venture out to visit Fiordo di Furore. You can also arrange a private boat from Praiano with a stop there and a drop-off at the marina in Amalfi in the morning. 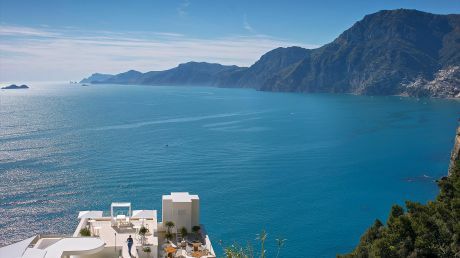 Either way, it a fantastic Amalfi add-on for those looking to explore more than just the main towns and beaches. If you can squeeze in a stay in Capri, do it. Otherwise, just head over for the day. Ferry over from Positano in the morning and take a private tour in the afternoon—at Villa Franca, they’ll make the arrangements for you—to see gorgeous grottos. 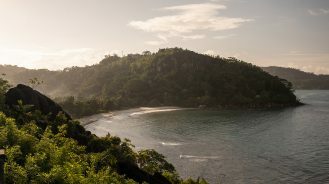 This three-hour excursion includes time to cool off with a swim in the open ocean. Grab some pizza back at the marina before boating back to Positano.